The Cards kick off their home pre-season campaign in style, with a hard earned display of high tempo attacking football. In front of 817 fans on Tuesday night, John Goddard’s pinpoint header into the bottom right corner on 55 minutes proved decisive, and they never looked like surrendering that lead. From the off, Woking got on the front foot, were well organised throughout, and made good use of the wide men, getting dangerous looking balls in and around the box from first to last. Goal scorer Goddard, Sole and Rendell were a constant threat for the U’s back four, with great movement off the ball and the seemingly telepathic ability to find each other with flick ons, interplay and passes. Even more impressive considering Michael Appleton had arguably selected his first choice back five for this game. The first ten minutes set the tempo for the rest of the game. Woking pressing high up the pitch, getting the ball quickly up to Rendell, Sole and Goddard at every opportunity. Woking attacks were interspersed by the occasional Oxford foray into the Woking penalty area. A half chance for Danny Hylton coming after six minutes, which he headed wide under pressure from two Woking defenders. The first clear cut chance for either team fell to Woking’s Joe Jones on 15 minutes. Stinging the palms of the impressive Sam Slocombe. Some sloppy passing at the back from the U’s, leading to a good chance for Jones to give Woking the lead, although Slocombe somewhat redeemed himself with that and other saves throughout the game. Without the impressive display from Slocombe, The Cards could have had two or three more. Woking’s next clear cut chance came on 35 minutes. A rocket from Arthur, unchallenged on the edge of the Oxford penalty area, but again Slocombe equal to it with an impressive save, diving low down to his left. The ball going out for one of many Woking corners, which eventually came to nothing. Oxford started the second half brightly, creating a few chances within the first 10 minutes, but Woking resolutely weathered the storm, and responded brightly, seemingly stepping up their game another gear, and never looked back from there. The goal came on 55 minutes, after a sustained period of Woking pressure. United pinned inside their own half, some neat play out to Jake Caprice on the right hand side, and that thorn in Oxford’s side, John Goddard drifting in unmarked to give Woking a well earned lead. Garry Hill then rang the changes on 60 minutes, bringing on Banya, Poku, Smith and Evans. Their hunger to impress from the bench was a delight to behold, and gave The Cards more of a pacey edge to their game for the last half hour, which Oxford Utd simply couldn’t deal with. Woking created chances from start to finish, Evans with a chance inside the Oxford box, after Rendell was allowed to bring the ball down, on 70 minutes, then Rendell himself heading over on 75, after some more good work on the right hand side, from the lively Evans. 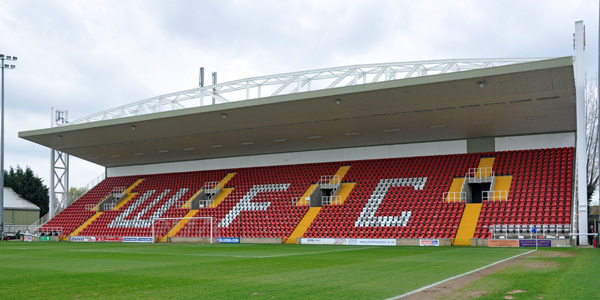 Woking: Jake Cole, Jake Caprice, Chris Arthur, Mark Ricketts, Ismail Yakubu, Brian Saah, Joe Jones, Keiran Murtagh, Scott Rendell, Guiseppi Sole, John Goddard. Used Subs: Charles Banya (60), Alex Smith (60), Koumssi Evans (60), Godfrey Poku, (60) Reece Beccles (75). Oxford Utd: Sam Slocombe, George Baldock, Joe Skarz, Kemar Roofe, John Mullins, Jake Wright, Liam Sercombe, Mickey Collins, Ryan Taylor, Danny Hylton, Alex Macdonald.